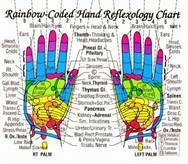 Did you know that per Chinese studies, your body has 340 know pressure points, 28 of these are in your hands? Pressure points or reflex points, are found throughout your body. When worked in the right manner, these points can offer pain relief for people of all ages. Join us for a great opportunity to learn self-help techniques in Hand Reflexology that can ease a variety of conditions that ail you. Reflexology works on the principle that there are reflex points on the hands that correspond to every part, gland, and organ in the body. By applying pressure to these points, tension is relieved in a corresponding body part and the body is encouraged to return to its normal balanced state. We will review certain techniques & how to ‘work’ the reflexes in your hands that relate to common ailments, as well as your specific disorders. Hand Reflexology is one of the more accommodating therapies when it comes to self-help care, which can assist in relieving headaches, improve sleeping & boost your energy, just to name a few. The benefits are unlimited! Please call 215-694-8928 to reserve your spot!